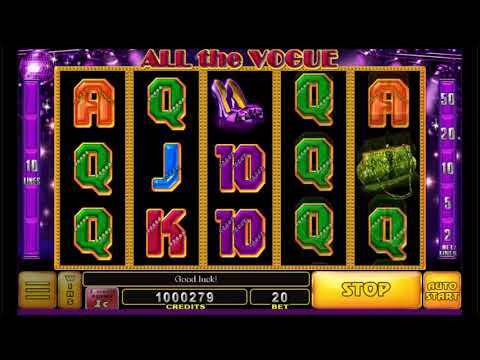 All the Vogue is a slot themed to the life of the rich and travelling that you can play for free at NeonSlots. This slot was developed by Noble Gaming. The game screen consists of 5 reels and 10 paylines. An expanding Wild and two Scatters are spinning on the reels of the slot. You can launch a double-up game and increase your payouts after each successful spin. If a spin on All the Vogue ends up in several combinations coming up in the game screen the payouts are added up. The right guess multiplies your payouts and lets you continue playing. The double-up game includes six rounds in total. But the wrong answer wipes out your latest win. If you want to stop the double-up game yourself, click on the face-down card. You have to set the bet before spinning the reels. Then, you can click any of the buttons that activate the reels. If a combination of 3, 4 or 5 identical symbols lands on a payline after the spin you get a certain reward. All the Vogue online slot features regular and automatic spins and the double-up game. Three bonus symbols diversify the gameplay. This slot has no free spins or bonus rounds. However, you can hit the jackpot in the full version.